That special night, Halloween, is creeping up on us. We cover all types of subjects in this newsletter, but this is an event everyone is familiar with. Magick and the Supernatural around this time of year aren't anything strange – it’s something we all actively look forward to. You’ll be familiar with the groups of young children who roam our streets hunting for candy and fun - dressed as all manner of Supernatural beasts and creatures. I smile when I see the young “witches” having fun with their pointed hats and broomsticks. It’s fun, and hard not to enjoy the funny image of cartoonish “witches”. Yet the whole carnival - Halloween in general - shows us how Magick and the legendary power of the Craft is so central to this annual celebration that almost everyone loves. There’s no end of movies, books and media that depict the power of Magick at Halloween. Some of the most popular movies of the last twenty years have featured great combinations of Magick with this time of year. From horrors to adventures – setting them at Halloween instantly makes it a more exciting mix. The likes of Tim Burton have made a career out of focusing on the spooky vibe of Halloween. Horror movies, such as the Halloween series and Sleepy Hollow have all been set around this time of year, and featured fantastical creatures and situations. Often, the use of Magickal abilities helps ramp up the fear factor. More lighthearted movies like the Adams Family and Hocus Pocus are more whimsical – but they still contain example after example of extraordinary events. Even the fictional world of Harry Potter seemed to go into overdrive at Halloween. Why do all these crazy things seem to happen at this one point in the calendar? The answer is simple – this has always been a time of year when Magick flows and the impossible seems possible. Let’s look at the way in which Halloween has historically been linked to Magick. There has always been a clear connection between this time of year and the Magickal arts. 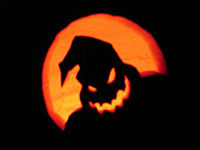 The mysterious festival of Samhain is the old Pagan festival on which Halloween rests. The ancient Druids of Ireland and Britain celebrated this night at the end of October as one of the most important nights of the year. Then, just as now, the veil between worlds is thin and provides Magickal opportunities like no other time of year. Fairies and otherworldly creatures were known to be very active on this night. Bonfires were lit and the spirits of those who passed on were contacted. It was viewed as a time when Magick and the Supernatural was to be expected, and the world of the living and dead came closer together than any other time of year. Echoes of these practices survive today. In Mexico, The Day of The Dead is celebrated on the first day of November. This is a special time to visit the graves and tombs of relatives, bringing offerings the deceased person loved in life, in order to honor their memory. There’s a special atmosphere surrounding us that we can all feel. The changes in the seasons, makes us feel we’re changing from one period to another. It’s this great change that the Magick of Halloween and Samhain taps into. The end of the harvest is vitally important in Halloween. The carving of scary and wild faces into the pumpkin again goes back to a Celtic tradition of using the fruit of the harvest to scare off any unpleasant spirits that slipped through from the other side. Here at the 7witches Coven, we’re preparing for the coming of this special event with great excitement. We plan to put the raw power of this time of year to good use, with two special Spells planned which will draw deeply on the spiritual power rushing all around us. 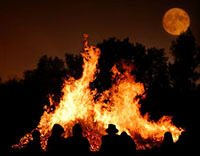 The unique atmosphere as the seasons change, fuels our special Samhain Ritual Bonfire. This special, once-a-year Spell is designed to ensure you can take advantage of the cleansing, raw power of the Samhain period. It’s not often that we are privileged to have such a seasonal event to give energy our Spells. We plan to use the thin barrier between the spirit world and this one to help power our Spirit Message Ritual. I am personally delighted we have this chance to cast such potent Magick for you at this time of year. I know it will be especially effective when we tap into the power of the elements and seasonal shift during the time of Samhain. Do you enjoy Halloween and all that comes with it? Have you ever experienced anything strange or supernatural at Halloween? Do you feel this is a special time of year? Please share your thoughts on our Facebook page, and as always, if you have any questions, do not hesitate to ask. I love Halloween since I was a child, drawing pumpkins and black cats gave me such different energy and joy. It seems to have a very high energy and you can feel it all night long as you attend parties and take kids out trick or treating. I have never experienced anything strange though but I have had people tell me they did.